some very good ground level shots, not often seen. Would have been so incredible to see this sight over Lower Manhattan again had they rebuilt them. do you remember where or how you found this picture? It's showing the Singer Building being demolished and I'm currently recreating that region in 3D in 1910. If I find where it was or its owner I hope to find more pictures of its ruins and realize how some parts were. 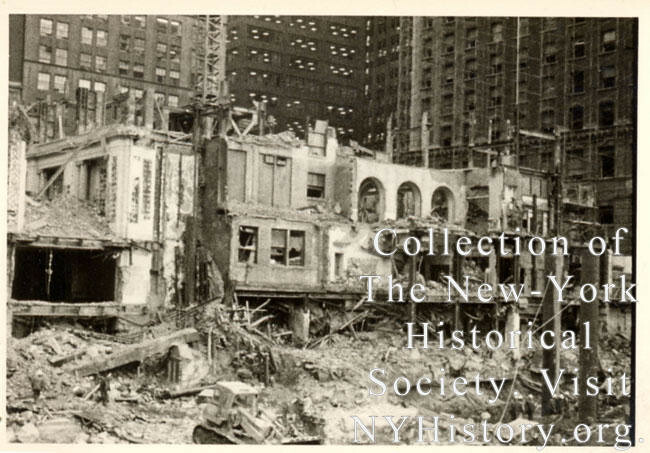 I tried to find it on nyhistory.org but I couldn't find the picture in their collections. I found this one from Trung Trung on flickr, I still have no idea how to get other photos from the NY Historical Society due to how awful their site is. I usually scavenge getty and other stock sites or different flickr accounts for the best pictures. Thank you very much, these collections will help me a lot!